Burke Animal Clinic is proud to offer the one vet service no pet owner should be without – microchipping. No one wants to experience the sadness of a lost pet. While microchipping cannot guarantee pets will never stray or will always be returned, it can greatly improve the odds. What Does a Microchip do for Pets? If you’ve had a pet for any length of time, you know how easy it is for collars and tags to slip off. This means that if your pet is lost without identifying tags in VA, the odds of it being returned to you are remote. That is because pets found without identifying tags may be considered “abandoned property” and placed for adoption, rehomed, or even put to sleep. If your pet is microchipped, though, every effort will be made to return your pet to you if it is taken to a shelter or brought in by animal control. Microchips cannot fall off, unlike dog tags and collars. They can’t be pulled off and people who steal pets are not legally allowed to sell pets that have been microchipped. The process itself is virtually painless, causing no more pain for your pet than routine vaccinations. Your veterinarian in Burke doesn’t even need to use anesthesia to implant the chips. Some pet owners, concerned about pain, have their pets implanted at the same time they are having them spayed or neutered, though it isn’t necessary at all. Pet owners choose to microchip their pets for a variety of reasons. They all come down to one thing, though. Your pet is a loving part of your family and microchipping by a qualified veterinarian in Burke gives you peace of mind that you are far more likely to be reunited if you become separated if your pet has been microchipped than if it has not. Not only do you have the peace of mind of being able to locate your pet if it is found close to home, but also if it is located far from home. 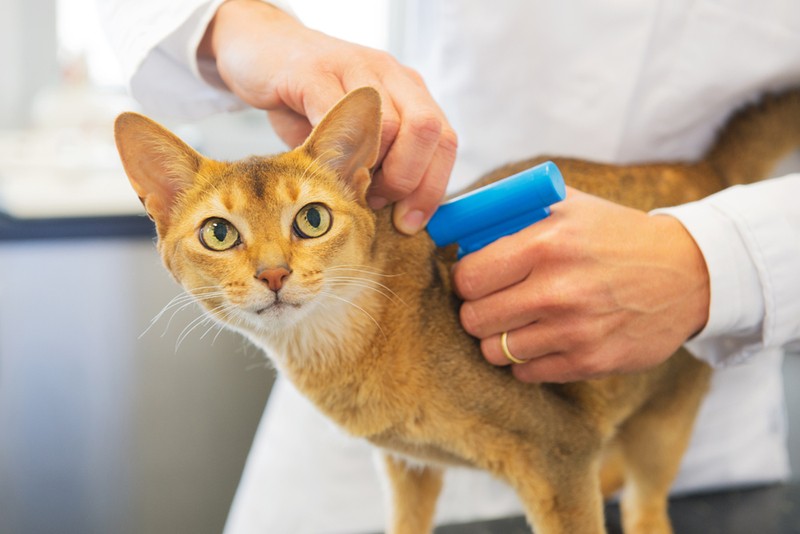 Whenever the microchip is scanned by a vet, clinic, or shelter; you will be notified. Make sure you register your pet’s chip and update the information whenever you move or your contact information changes. The other benefit is that microchips meet the burden of proof when it comes to proving ownership of a pet. It is notoriously difficult to prove ownership of pets in claims of a stolen pet. Microchips offer irrefutable proof. Contact Our Local Veterinarian in VA today. Burke Animal Clinic is happy to answer any questions you have about the process of microchipping your pets and the benefits it provides. Call us today at 703-569-9600 to schedule your pet’s microchipping appointment.